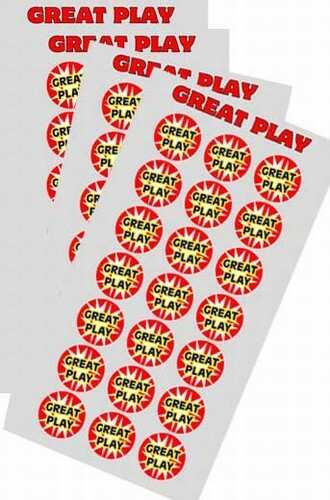 This is a team pack of "Great Play" helmet decals. GREAT PLAY TEAM PACK- helmet decals. Every great play deserves recognition. The helmet decal sheet has 21 "GREAT PLAY" decals; 6 sheets per pack. Hockey players can add a helmet decal to their collection for every great play that they're a part of. GREAT PLAY TEAM PACK helmet decals. Every great play deserves recognition. The helmet decal sheet has 21 "GREAT PLAY" decals; 6 sheets per pack. Hockey players can add a helmet decal to their collection for every great play that they're a part of.